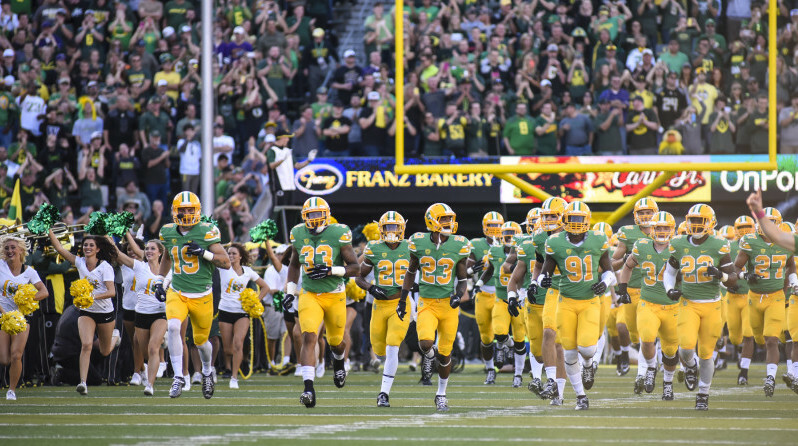 Fall camp for the Oregon Ducks wrapped up last week, and at long last, game week is upon us. But before we dive into Oregon’s much-anticipated matchup with Eastern Washington, we ought to break down just how fall camp went for these Ducks and take a look at the shiny new depth chart, released on August 28. In a video for Duck Sports Authority taken a day prior to the depth chart’s release, Oregon Ducks Football News’ Warren Williamson spoke with DSA’s AJ Jacobson in hopes of wrapping up fall camp with some stories, players, and position groups to keep an eye on heading into a new season. 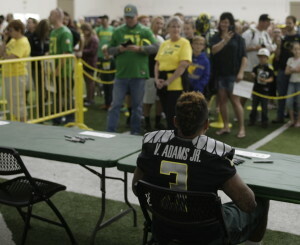 Fans are excited to see what Vernon Adams will do this year after he was named the starter. The big news last week was that Vernon Adams, after only being on campus a scant three weeks, has been named the opening day starter for this week’s matchup against his former team. And while Jacobson couldn’t possibly be privy to his anointment at the time of the interview (in fact, Jacobson suggested Jeff Lockie would be the opening day starter), he did offer his two cents on the Ducks’ freshest face. This development has to be the chief reason Adams was named the starter. Really the only reason the quarterback competition was even close to begin with was Jeff Lockie’s superior command of the playbook. When Adams closed that gap more quickly than expected, it was inevitable he would be named starter, as he has physical tools that Lockie simply does not possess. “Vernon is a terrific athlete. We hear he has the arm to make all the throws,” Jacobson said. “He’s got the long ball, which is something we haven’t seen a lot here lately.” While Marcus Mariota may have something to say about that last bit, it’s exciting to hear that Adams has all the tools to be a difference maker and focal point of this high-tempo Oregon offense. Jacobson and Williamson also touched on the impressions of the Duck defense during fall camp, and previewed how this year’s incarnation may have a different feel than what fans are used to. 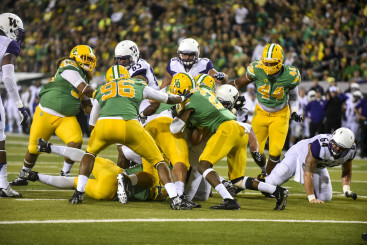 Oregon’s rush defense should a strength in 2015. The strength of the defensive line is unsurprising considering the losses in the secondary (more on that in a bit). What is surprising is the notion that Oregon is going to be a good run-stopping team, something Oregon fans haven’t seen in a long time. This is very encouraging to hear after the shellacking that group took in last year’s national title game. But will the front seven have a secondary to match? 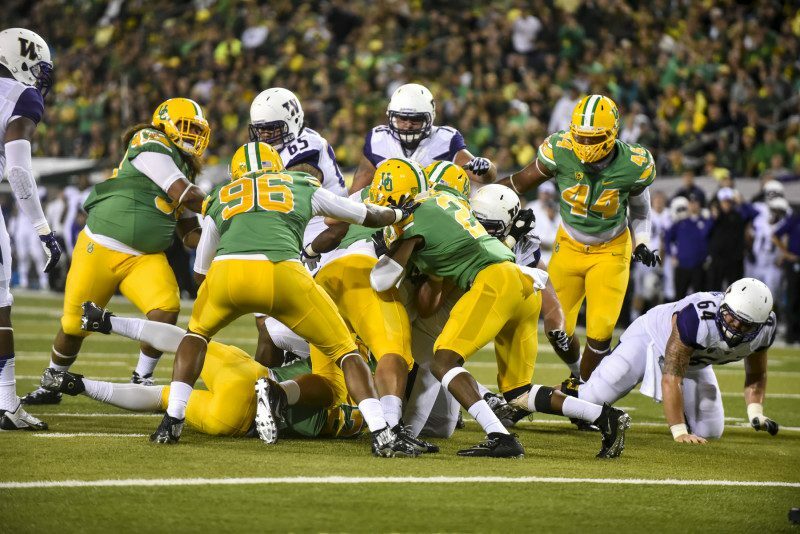 This has been an oft-discussed weakness for this year’s Oregon team, as has some fans worried about Oregon’s chances at a repeat appearance in the College Football Playoff. Sophomore Chris Seisay looks to anchor a reloading secondary. Jacobson seems to think that this group is in prime position to surprise some people, due in large part to excellent recruiting over the past few years. 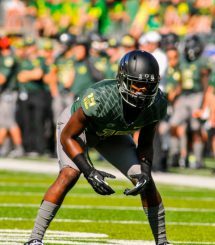 Prior to the release of the depth chart, we knew sophomore Chris Seisay would be starting at one corner position, but after that it was anyone’s guess. August 28 put the speculation to rest, as fellow sophomore Arrion Springs (ESPN’s #6 CB in the 2014 class) will start at the other corner position. However, a name to watch out for is former QB turned corner Ty Griffin, who has really impressed defensive backs coach John Neal. While he isn’t slated at number two on the depth chart, Griffin did make the two deep, which again, is absolutely incredible. Whether that says something about the talent around him or Griffin’s ability is hard to say, but it appears that he has two big fans in coach Neal and seasoned DSA analyst AJ Jacobson. After a long offseason and a solid few weeks of camp, I’m sure the players and coaches are eager to get out on the field and show the nation what they can do in 2015. While hanging 50 on Eastern Washington might be fun for the fans, it won’t go a very long way toward proving the quality of this year’s squad. This game is little more than a warm-up for the Ducks, who face a much greater challenge in week 2 on the road against the Michigan State Spartans. For now though, let’s enjoy the fact that it’s finally game week and college football is back. Is FishDuck a NEGADUCK or HOMER? I am neither as I am both. This site wants all opinions and even if you are in the minority–we want to read it. You will be protected by our rules as we are only GUARANTEED TROLL-FREE Oregon site, and will always be that way. I simply write it the way I see it, and I invite you to do so as well!